Lantern staff reviews the newly released movie "A Star is Born." As I walked into the Northfield movie theatre, the smell of buttered popcorn and salt lingered through the air. Once I sat down in my relaxing recliner chair with my fuzzy blanket, I could just feel that I was going to be watching a marvelous movie. I didn’t know what to expect, but I enjoyed the beautiful, romantic, music story. On October 5th, theaters released the new wondrous film, A Star is Born. Watching this movie is very inspiring and maybe a little bit emotional throughout most of this film. A Star is Born greatly portrays the feeling of having a voice and being inspired by others. In this new take on this tragic love story, there is definitely chemistry between a famous male artist who’s struggling (Bradley Cooper) and a young female artist (Lady Gaga) that’s soaring to the top. 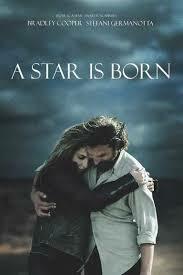 This is the latest and fourth version of A Star is Born. In the film, Bradley Cooper recreates his character, Jackson Maine, a country rock musician, who has a problem with substance abuse. The romantic story soon begins when he meets, Ally Campana (Lady Gaga), performing at a Hollywood drag bar. With surprise, he then watches Ally belt out Edith Piaf standard “La Vie en Rose.” After the performance, she becomes real and raw with him by taking off all of her makeup. In a swoon, they fall in love and he soon invites her to go on tour with him which then leads to Ally becoming a huge pop star. One huge impact that made this movie so loving from others, was the beautiful music incorporated into the film. Some viewers listen to the album and fall in love. The most popular song sang by Bradley Cooper and Lady Gaga was “Shallow.” Lady Gaga wrote this song and in the film sings it at a gas station to Maine. The sound to his ears was incredible which is why he encouraged Ally to break out of her shell and sing this astonishing song to a full crowd. Another touching song was called, “I’ll Never Love Again.” Ally and Jackson wrote this song together and it was the last song Jackson ever sang. Not only did Lady Gaga perform with her heart throughout the movie, but Bradley Cooper had also taken private singing lessons so he could sing to the best of his ability. While acting along with singing, Cooper also first-time-directed a drama production. While this film was very saddening, I would definitely watch it over and over again and never get sick of it. As Bradley Cooper tries new things by singing and directing, Lady Gaga’s acting career is just taking off. Even though it did have an R as a rating, I would definitely recommend anyone to go see this sentimental yet tremendous film.